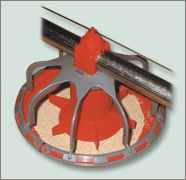 The PX2 pan feeder, with its unique plastic feed level tube, is easily adjusted — just rotate the tube to any one of eight snap-lock settings you desire. Partitions built into the tube are designed to reduce waste and allow easy entry and exit for even the smallest birds. The PX2 is self-leveling, has an extra high pan cone, feed-saver flange and easy snap-on/off feature.